Luz is a dystopian mess. While her boyfriend Ray spends his da ys gathering water and working around the former starlet’s mansion where they squat, Luz stays in the bedroom, trying on the starlet’s many glamorous dresses, or laying listlessly in bed. They are Mojavs, living in a Los Angeles depopulated by years of drought. Ray, an Indiana transplant and veteran of the Forever War, accuses Californians of being quitters: too rootless, always moving, always in search of the dream or the get rich quick scheme, and giving up too easily on place and home. Luz views Ray as her strength and solace. When they happen upon a two-year-old child that they suspect is abused, Luz gains a sense of purpose. But with the child’s discovery comes a sense of danger, and a secret from Ray that begins to undermine his credibility. Soon, they find themselves in the middle of a huge sand desert that is swallowing the Southwest mile-by-mile. There, a community of holdouts offers the sense of place and belonging that Luz has always sought; but belonging is fraught with intrigue and danger, and will require of her an ultimate choice. If you need an ending that ties all the loose ends into a bow, this book might not be for you. But I found it to be an interesting and original novel about the West. 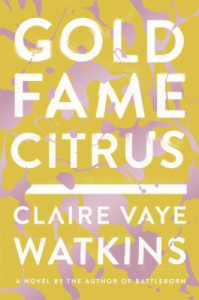 To check out Gold Fame Citrus or other books by Claire Vaye Watkins, search our Catalog. Or just ask a librarian!